Black women are more likely to be diagnosed at later stages of breast cancer partly due to barriers to timely screening mammography, resulting in poorer mortality and survival outcomes. The use of patient navigators – individuals who provide guidance to patients to help overcome various barriers to care – may reduce breast cancer disparities. One way to improve the effectiveness of patient navigation is to recognise how minority women's views on gender and race/ethnicity may affect how they seek help and support for their health needs, according to a new study published in CANCER, a peer-reviewed journal of the American Cancer Society. The Patient Navigation in Medically Underserved Areas (PNMUA) study was a randomised clinical trial that examined the rates at which women reported barriers to obtaining a screening mammogram. Participants were randomly assigned to one of two groups; one group received a patient navigation support intervention and the other group served as a control. Of 3,754 women who received the patient navigation intervention, only a small proportion of women (14 percent) identified one or more barriers, which led to additional interactions with navigators who helped overcome barriers. Black women, women living in poverty, and women who reported high levels of distrust of the health care system were the least likely to report barriers, and therefore were less likely to receive additional support. In comparison, women who reported barriers were more likely to have additional contact with navigators and obtain a subsequent screening mammogram. According to researchers, the ability to recognise barriers may determine women's likelihood of reporting barriers and consequently receiving additional support. For example, medical distrust due to past and current experiences of blacks, as well as social norms and images of women, may influence how black women deal with their own needs and interact with healthcare providers. 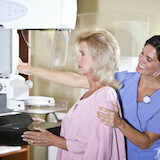 The findings suggest that "women who do not trust the healthcare system may not feel comfortable telling care providers about their barriers that could potentially affect the ways in which they engage in healthcare," says Sage Kim, PhD, of the University of Illinois at Chicago's School of Public Health and UI Cancer Center, who led the study. Although patient navigation is known to be effective, Dr. Kim notes, it is important to understand how minority women and women living in difficult life circumstances interact with this intervention and improve services accordingly. "If we don't, providers may have a false sense of security," she says. "They might incorrectly assume that women who do not report barriers are not in need of patient navigator support and are all doing well." The findings also highlight the need to enhance training of patient navigators and pay close attention to how patient navigator interventions are implemented, so that women are better able to seek out needed assistance. "It is not enough to implement a well-tested intervention, because it might not be equally effective for all groups across race/ethnicity and economic conditions," Dr. Kim explains.